News › Stories › Archives › 2015 › January › Carnegie Mellon Trustee and Business Leader Luis Ball To Discuss "Latin America: The Unnoticed Giant South of the Border"
Carnegie Mellon Trustee and Business Leader Luis Ball To Discuss "Latin America: The Unnoticed Giant South of the Border"
For many Americans, the perception of Latin America has been heavily influenced by the 400-year rivalry between England and Spain. Venezuelan-born Luis Ball, a Carnegie Mellon University trustee and business leader, will discuss how popular views of Latin America, its history and even its scholarly writing start with pre-conceived ideas based on myth, not reality. In "Latin America: The Unnoticed Giant South of the Border," Ball will discuss the history of the region in the context of U.S. history, colonial laws regarding native tribes and peoples, and the Catholic Church and the wars of independence. He will discuss the developments in the post-colonial period that shaped Latin America and its attitudes vis-a-vis the U.S. Additionally, he'll examine the revolutions and dictatorships, economic underdevelopment and Latin America today. Ball's lecture will be held at 4:30 p.m., Thursday, Jan. 29 in Porter Hall 100. Admission is free and open to the public. "Luis is not only a successful businessman and a generous trustee of Carnegie Mellon, but he has also worked hard through the media to provide an informed view of Latin America to North Americans, who generally get very little information about events in South and Central America," said Richard Scheines, dean of the Dietrich College of Humanities and Social Sciences. "Luis publishes PanAm Post, an incredibly rich online site that covers news and offers excellent analyses of all regions in the Americas." Ball, who received a bachelor's degree in managerial economics from Carnegie Mellon, is the chairman and chief executive office of GroupCiencia and Allegheny Medical Systems, both Boca Raton, Fla.-based companies that distribute high-tech medical devices in a dozen Latin American countries. In addition to serving as a CMU trustee, Ball is a member of the Latin American Business Council (CEAL), a director of the Nucorpa ad agency in Caracas, Venezuela, and of Telares de Palo Grande, a textile company listed in the Caracas exchange. He is a member of the board of trustees of Choate Rosemary Hall, the prestigious secondary school in Connecticut and the World's Presidents Organization (WPO), and was a 20-year member of the Young Presidents Organization (YPO). Carnegie Mellon's University Lecture Series and the Dietrich College are sponsoring the event. 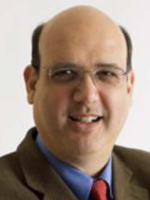 Luis Ball (pictured above) publishes PanAm Post, an online site that covers news and offers analyses of all regions in the Americas.